To speed up your Metabolism, boost Energy, and reduce Stress, Try it for one month - and you will like the results. Enerex GREENS Mixed Berries is a nutrient-dense, energizing, and alkalizing synergy of Raw Super-foods enhanced with 9 Superfood Berries. It not only tastes fantastic, it is packed with vitamins, minerals, proteins, enzymes, phytonutrients, probiotics, and antioxidants (3300 ORAC per serving! ), and only ~100 calories per serving. You may mix it with water, but the best effect is to mix it with Kefir (Kefir is not the same as Yogurt) - get organic from your local Health Food Store, and have it for breakfast, take 1 capsule of Simply Trim (Green Coffee Extract with European Ash Seed). tress, you will look, and Feel Great. Try it, and you will like the results. Use Superfoods with Fiber Buddy to give your body bulk while on this liquid diet, and to eliminate craving for food. While on the diet you may also decide to get rid of bad bacteria and parasites at the same time use Knock Out - it is a great benefit to treat your body, the way you treat your car or house (always remembering about maintenance check-up). There are no other ingredients added to this formula. *Certified Organic by QAI (Quality Assurance International). Blend or shake 2 rounded teaspoons (10 g) of Enerex GREENS with 250 ml of liquid. Best if consumed immediately, first thing in the morning. Can be blended with Enerex ENHANCED PROTEIN, ENHANCED FIBRE, and SONA PURE Multivitamin Powder for the ultimate health drink. Also add to smoothies or any food preparations (avoid high heat). Store in a cool, dry place. Keep out of reach of children. 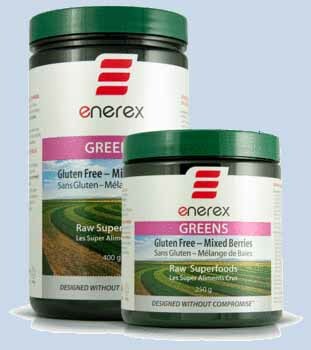 Enerex GREENS Gluten Free Mixed Berries is 3rd party tested to verify less than 20 parts per million gluten. Enerex products are housed in recyclable BP-free PETE plastic containers to provide the best protection against oxidation, moisture, sunlight, and chemical migration from container to product. In all of these areas, PETE is virtually equal to that of glass but without the larger environmental footprint left by glass packaging. PETE plastic is far superior to that of HDPE plastic in all regards; HDPE plastic is used for the majority of products on the market. Unlike more costly PETE bottles, HDPE plastic facilitates the immediate degradation of the product inside as it is not a barrier to oxygen or moisture; studies also show high concentrations of chemical migration from HDPE bottles to product relative to that of PETE and glass bottles. When you start the program, you need to control your food intake in the first three days, unless you decide to clean up your system, and give your body bulk (very important) at the same time using the Fiber Buddy, then your desire for food goes down, you do not feel hungry, no craving for food or sweets. Do not try to build up your will power while losing weight (save the will power for the more important needs). Superfoods is the perfect food - 21st Century FOOD - easy to use everywhere. You may use it when on the road, instead of fast foods (fast foods have no value for your body, just bulk; fat and "glue"). If you need to lose weight quickly, take 3 or 4 times per day with no additional food intake, take Fiber Buddy at least once a day, the best time is before bed time. You may use twice a day plus the 600-800 calories dinner, when you are not in need to lose weight quickly (you are not going to Bahamas in three weeks and want to fit size 14 instead of size 18).